The Global Retail Development Index 2017 finds that geopolitical instability and the growing power of local and regional competition in emerging markets are forcing global retailers to rethink their strategies. At the top of this year’s Global Retail Development Index rankings, India and China have switched places, with India overtaking China for first. 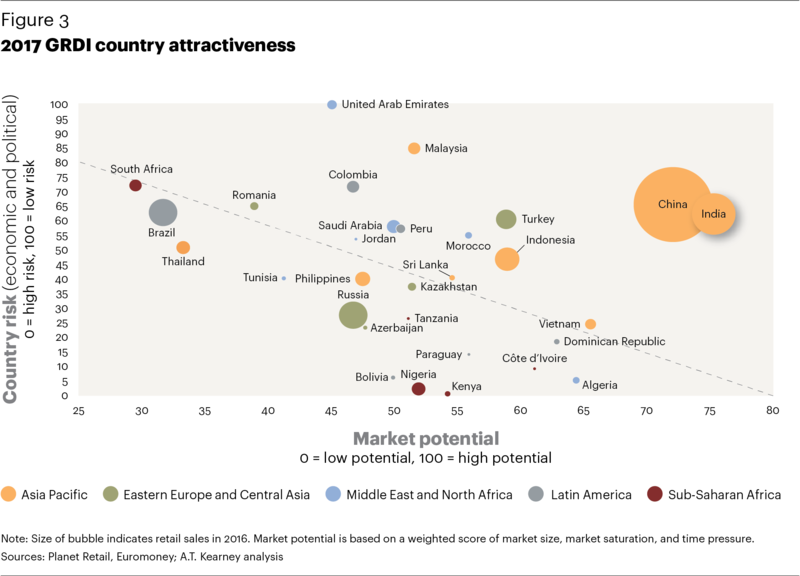 In terms of both size and momentum, Asia is the driving force behind global retail and the expansion of branded food and beverage, personal care products, apparel, fashion, and luxury. North Africa is making a comeback with the Arab Spring in the rearview mirror, while the Gulf Cooperation Council (GCC) region, specifically the United Arab Emirates and Saudi Arabia, is developing new ideas for growth. Sub-Saharan Africa keeps growing and South America’s Andes markets continue to impress. Russia and other countries in the Commonwealth of Independent States are still battling with sluggish growth. 1 India 71.7 With a growing middle class and rapidly increasing consumer spending, India overtakes China for the number one spot in this year’s GRDI. 2 China 70.4 China, long the Index leader, drops to second place as the market matures, but the country still leads the pack in other areas, most notably e-commerce. 3 Malaysia 60.9 Malaysia’s long-term prospects are strong, thanks to tourists, higher disposable income, and government investments. 4 Turkey 59.8 Despite serious challenges in the past year, Turkey moves up two places to 4th in this year’s Index. 5 United Arab Emirates 59.4 The United Arab Emirates remains the most attractive market in the region, as growth opportunities expand beyond saturated Dubai. 6 Vietnam 56.1 Vietnam moves ahead and is emerging as an important market for retail expansion with its liberalized investment laws. 7 Morocco 56.1 Morocco continues to rise in the rankings thanks to government efforts to attract foreign investments. 8 Indonesia 55.9 Indonesia has long been an elusive target for foreign retailers, but continued liberalization and infrastructure investments are attracting more foreign interest. 9 Peru 54.0 Peru continues to outperform other regional economies, the result of two decades of solid growth. 10 Colombia 53.6 Despite lower than expected GDP growth, Colombia has remained attractive for retailers. 11 Saudi Arabia 53.6 Saudi Arabia is focusing on diversifying its economy away from oil, and the retail sector is in the spotlight. 12 Sri Lanka 51.8 Sri Lanka retains its 12th position in the Index despite sluggish GDP growth due to reduced investment from China, lower remittances, and moribund export markets. 13 Dominican Republic 51.7 Despite relatively low GDP per capita, trade-friendly policies make the Dominican Republic an attractive destination for investments. 14 Algeria 50.1 As oil revenues fall, Algeria’s economic circumstances remain difficult and consumer spending has dropped, but the country has risen four position in the Index. 15 Jordan 49.0 Jordan’s economy is gradually recovering from the aftershocks of regional conflicts. 16 Kazakhstan 48.4 Despite expected GDP growth through 2019, Kazakhstan falls 12 spots in this year’s rankings. 17 Côte d’Ivoire 48.4 The combination of a underpenetrated market and GDP growth of 8 percent makes Côte d’Ivoire an attractive target for retailers that can manage the risks. 18 Philippines 46.8 The outsourcing industry is boosting incomes and propelling retail growth as the Philippines’ large retail market begins spreading beyond the big cities. 19 Paraguay 45.7 Paraguay’s GDP grew well above Latin American averages in 2016, driven by investment incentives and manufacturing. 20 Romania 45.6 With 20 million people, Romania is a natural expansion target for foreign retailers looking to enter Eastern Europe. 21 Tanzania 45.4 Making its Index debut, Tanzania has a fast-growing economy and an underdeveloped retail market. 22 Russia 43.2 The Russian economy continues its slow path to stabilization, but timelines remain unclear. 23 Azerbaijan 42.9 Azerbaijan’s GDP has begun to recover, but the economic outlook remains uncertain and dependent on oil prices. 24 Tunisia 42.7 Tunisia rises two positions amid small improvements across all dimensions of the Index. 25 Kenya 41.3 A growing population, increasing per capita incomes, urbanization, and a property boom make Kenya attractive for modern retail. 26 South Africa 40.2 South Arica’s apparel and e-commerce sectors are growing rapidly, as local retailers seek new ways to grow. 27 Nigeria 39.9 Nigeria presents immediate challenges, yet its large population, growing middle class, and long-term potential keep it on the Index. 28 Bolivia 39.6 After a decade of five percent average GDP growth driven by natural gas and mining exports, Bolivia enters the Index for the first time this year. 29 Brazil 39.3 Brazil drops nine spots on the back of a contracting economy, political chaos, and record unemployment. 30 Thailand 37.8 Thailand re-enters the Index this year despite political and security challenges. To read the whole index or the report, The Age of Focus: The 2017 Global Retail Development Index, go to the website of ATKearney.